Menu Description: "Tender steak, lightly breaded and golden fried. Smothered with country milk gravy." Alex Schoenbaum opened the doors to his first restaurant, Parkette, a drive-in in Charleston, West Virginia, in 1947, at the start of a boom in popularity of the classic American drive-in restaurants many of us know only from reruns of Happy Days. Schoenbaum's restaurant did very well and he decided, in 1951, to purchase a Big Boy franchise, the fastest growing chain at the time. In 1953, Parkette changed its name to Shoney's Big Boy. Today Shoney's is no longer affiliated with Big Boy, but maintains a menu that features the Southern homestyle favorites that have made it so successful for so long. 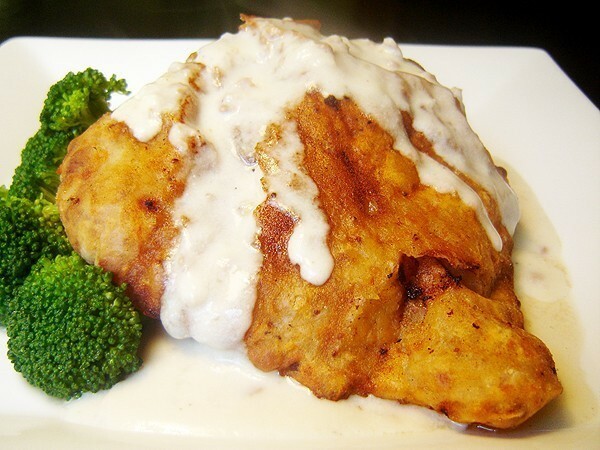 One of the old-time favorites is the Country Fried Steak smothered in peppered milk gravy. The technique here is to freeze the steaks after they have been breaded with flour. This way the coating won't wash off when the steaks are fried—the same technique the restaurants use. 1. Prepare the steaks at least several hours before you plan to serve this meal. First, sift the flour, salt, and pepper together into a large, shallow bowl. Pour the milk into another shallow bowl. 2. Trim the steaks of any fat, then use your hand to press down firmly on each cube steak on a hard surface to flatten it out a bit. You don't want the steaks too thick. 3. Dredge each steak, one at a time, first in the milk and then in the flour. Repeat this one more time so that each steak has been coated twice. 4. When all four steaks have been coated, place them on waxed paper and put them into the freezer for several hours until they are solid. This is the same technique used at the restaurant chain to ensure that the flour coating won't fall off when frying the steaks. 5. About 10 minutes before you are ready to cook the steaks, prepare the gravy by browning the ground beef in a small frying pan. Crumble the meat into tiny pieces as you cook it. 6. Transfer the meat to a medium saucepan over medium heat. Add 1/4 cup flour and stir it in with the ground beef. Add the remaining ingredients for the gravy and bring it to a boil, stirring often. Cook for 10 to 15 minutes until thick. Reduce the heat to low to keep the gravy warm while the steaks are prepared. 7. As the gravy is cooking, heat oil in a deep fryer or a deep frying pan over medium/high heat to 350 degrees F. You want enough oil to cover the steaks when frying. 8. When the oil is hot, drop the steaks, one at a time, into the oil. Fry for 8 to 10 minutes or until golden brown, then drain on paper towels. 9. Serve the steaks with gravy poured over the top, with a side of mashed potatoes, grits, or steamed vegetables, if desired.